The Gateway Quarter has just signed their latest retail tenant. Segway will be opening up their 6th Ohio location and 2nd Cincinnati area store at 1150 Vine Street (directly across from Park+Vine). The store will be selling the Segway Personal Transporter (PT) which generally cost around $5,000 – $6,000. The Electric Personal Assistive Mobility Device (EPAMD) is a “self-balancing, non-tandem, two-wheeled device that can turn in place, transports only one person, with an electric propulsion system averaging less than one horsepower, and travels less than 12.5 miles per hour.” The ‘green’ transporters produce zero emissions and can travel up to 24 miles on a single charge. 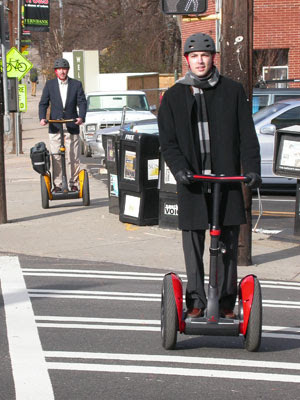 Segways are treated the same as pedestrians and bicyclists and should not be taken on the road with vehicular traffic. You can currently find several police forces around the area using these devices. They generally fit through doorways and are great urban transporters. The OTR store could be open in as little as 30 days since minor finishes are needed in the new retail spaces created by the Gateway Building. The store will also be renting Segways and offering rent-to-own programs for those looking to buy a Segway. Segway also offers tours with one Cincinnati area tour (PDF) operating in Eden Park. The opening on this OTR store could be the jumpstart for a Segway tour through historic Over-the-Rhine and/or Downtown – stay tuned. Also be sure to check them out during the Downtown Tour of Living as Segway will have Segway PTs on display and available for test runs at the Gateway Quarter parking lot at 12th & Vine.